If you’ve visited Portugal, I trust you’ve been to a handful of cafes. You’ve also visited a few delicatessens, in lieu of the fact that they’re housed within the cafe. What you most likely haven’t experienced is a cafe that not only has a delicatessen, but a bed & breakfast along with an electric tram that offers live Fado paired with a wine and cheese tasting. That, my friends, is what we call “covering the bases”. Owner, head waiter, and Portugal enthusiast, Carlos Gartner has always loved his native country. His passion has run so deep, that after retiring as a microbiologist, he opened Linha22 to reintroduce Portugal back to the Portuguese. Granted, we’re biased because we love Portugal, but we couldn’t agree more. It’s not abnormal to see your culture, your cuisine, as less than, subpar, uninteresting simply because it’s yours and you’re used to it; but every culture has their points to celebrate, and Portugal is swimming in a sea of greatness! This past weekend, per Carlos’ request, we took a ride on his iconic Linha22 Tram; the same tram that once traveled past his cafe on Rua dos Clerigos almost a century ago. Built in 1929, the tram is decked out in all its formal glory from wicker seats to hardwood floors. It’s a fantastic way to see Porto, especially when serenaded with live Fado music – an incredibly risky venture if the singer isn’t damn good, but I’m happy to report that she was. The tour runs approximately two and half hours and costs 25 euros, allowing ample time to savour a white Douro wine and a Ruby Port paired with a Portuguese cheese, which were all fantastic! However, if we had to nitpick, we’d love a touch more cheese and an extra sip of wine to compare and contrast. Otherwise, some context here and there as to what we’re seeing in route would be fabulous. But these are just suggestions for an already lovely experience. 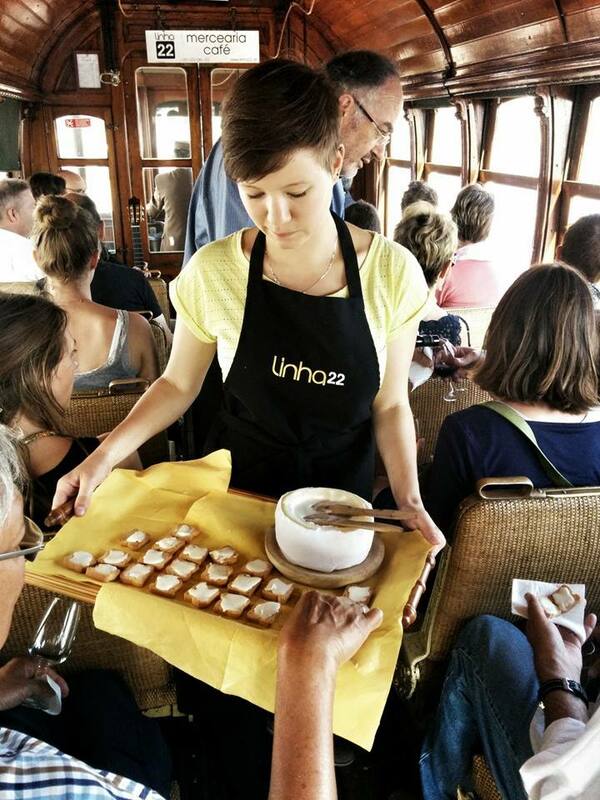 At the end of the tour, passengers are invited to a 10% discount on anything purchased within the Linha 22 Cafe; which isn’t a bad deal when considering their list of wines and traditional Portuguese fare such as Salpicão, Chouriço, Linguiça and Presunto – four gorgeous Portuguese sausages; not to mention their Caldo Verde (traditional kale and potato soup) and Bifanas (seasoned pork sandwich). And being that Carlos is desperately wants you to expand your Portuguese horizons, he’s gone so far as refund your money on anything you don’t enjoy. That is what I call dedication! The tour is a wonderful way to see the city, and if you’re needing a place to crash for the evening, the top two floors have rooms available.